SPONSORED: From designers to tradespeople to accountants, hundreds of professionals are helping upgrade air travel in the state, both in the terminal and behind the scenes. SPONSORED: As you drive away from Ted Stevens Anchorage International Airport you'll pass a sign welcoming you to Anchorage. Soon afterwards the trees open up on the right side of the road to reveal a massive new airplane hangar decked out in Alaska Airlines' signature blue. If you're one of the many Alaskans employed to design and construct the hangar, you probably feel a sense of pride as you pass by. Kiel Beloy certainly does. Beloy is vice president of Kiewit Building Group Inc., the firm Alaska Airlines hired to construct the latest addition to the airport's landscape. He's one of hundreds of Alaskans working on the 2020 Great Land Investment Plan, the airline's statewide infrastructure and cargo fleet initiative. A project the scale of the hangar involves dozens of folks even before site-work begins. Then there's the workforce involved in the actual construction. And that's just scratching the surface. "You definitely need the people that I would call your direct influence on the project," said Beloy. "That would be your designers, your lead architect, which in this case is McCool Carlson Green — a local, well-respected, architecture firm. Those guys did a great job with this project." 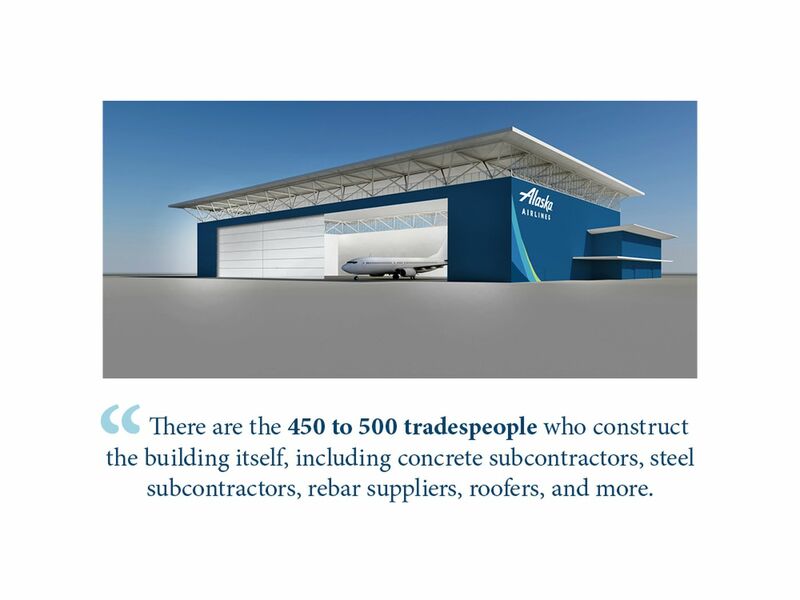 Then there are the 450 to 500 tradespeople who construct the building itself, including concrete subcontractors, steel subcontractors, rebar suppliers, roofers, and more. "Keep in mind, for every direct person, that works out here, you have some indirect folks that are tied to it," said Beloy. "For example, our roofer. They might have 10 or 12 people on the project at any given time, but at their main office, (there's also) someone doing payroll, someone answering the phones for them, someone doing the estimating, someone signing off on the checks." 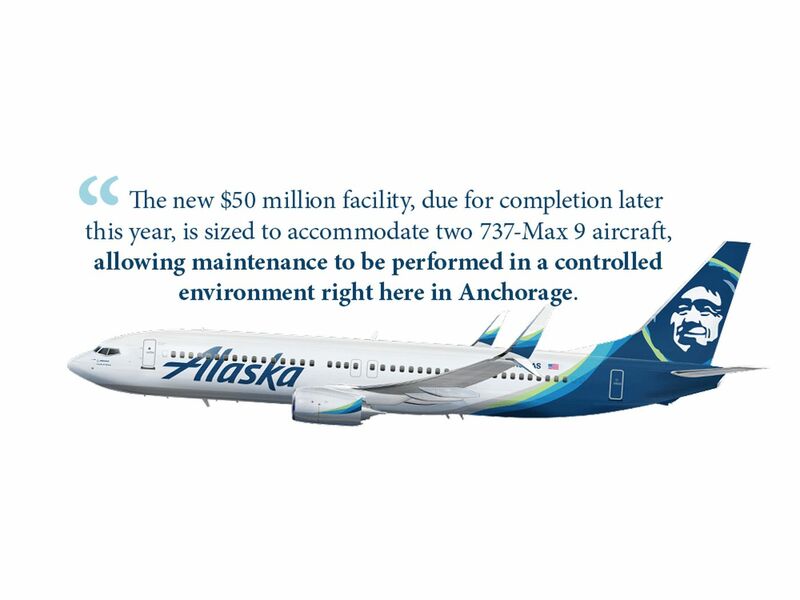 This is a 100,000 square foot project that replaces Alaska Airlines' current hangar in Anchorage, which — at 44,000 square feet — can no longer accommodate Alaska's fleet of larger planes, such as the new 737-800s and -900s, as well as the 737 Max 9s that will join the fleet in the future. "It provides a state of the art maintenance and engineering facility to service new aircraft that are more fuel efficient and provide greater connectivity in-state and between Alaska and the Lower 48," said McCool Carlson Green's Jason Gamache, lead architect for the project. The new $50 million facility, due for completion later this year, is sized to accommodate two 737-Max 9 aircraft, allowing maintenance to be performed in a controlled environment right here in Anchorage. "The ability to perform maintenance functions in-state enhances our operational effectiveness here in Alaska," said Alaska Airlines Regional Vice President for Alaska, Marilyn Romano. "You'd much rather pull it into a hangar here, work on it overnight, so it can be ready to go first thing in the morning. Having a state-of-the-art maintenance facility based in Anchorage ensures Alaskans can count on us to provide safe, reliable service day-in and day-out." The new hangar is only one component of the 2020 Great Land Investment Plan. Alaska Airlines has already achieved a second major objective – that is replacing its 737-400 Combi (cargo + passenger) planes with three freight-only 737-700s. The Plan's third component involves modernizing rural stations the airline owns and maintains across the state. Several need upgrades to better accommodate TSA's functionality in terminals that weren't designed for a full-scale security operation. For example, in Kotzebue TSA has taken up much of the boarding area leaving fewer than 10 seats available for travelers' use. "We don't want that for our guests," Romano said. "In these rural stations, people are flying in from smaller communities and end up sitting in one of our terminals waiting for their connection. We know our terminals are gathering places for a number of reasons. They have friends and family that come and meet with them, or there's a kids' basketball team from a small village that now is doing their homework on the floor, eating pizza from the local restaurant. So we want it to be a welcoming and friendly experience." The Kodiak, Cordova and Yakutat stations have already been remodeled while Kotzebue is currently in process, Romano said. Wrangell, Petersburg, Nome, and Bethel are scheduled for updates; Barrow and Deadhorse will be more extensive. While much of the economic impact of the 2020 Great Land Investment Plan will be seen in Anchorage, the whole state benefits, Gamache said. "This project has helped our firms bridge a weak local economy," Gamache said. His firm employed eight people for the design phase and subcontracted with another 24. "Not only do (these projects) provide good jobs during the pre-construction for Alaskans," he said, "but everyone involved (in the construction project itself) got a paycheck." There's also a certain satisfaction in being involved with a high-visibility construction project. Beloy took his kids with him to the groundbreaking ceremony for the new hangar. "They were taking photos and watching Alaska Airlines help us break ground," he said. "When we drive by there, they always say something to me. 'Hey Dad, that was the site that we helped to put the groundbreaker in, right?' Even (my kids) have a little sense of pride." Alaska Airlines proudly flies to Yakutat, Bethel and 19 other communities in Alaska. Club 49, available only to Alaska residents, is our way of showing gratitude to the state that gave us our name and the people who've kept us flying for more than 85 years. Members enjoy exclusive benefits like two free bags, Travel Now discounts, weekly fare sales, and our newest benefit Freight for Less. Now you can ship up to 100 lbs. for $10 when you fly, and $40 anytime. This article was produced by the creative services department of the Anchorage Daily News in collaboration with Alaska Airlines. The ADN newsroom was not involved in its production.